Let’s recap. In last year’s Cromnibus (soon to appear in the next Transformers movie), Congress left out funding for DHS. Why? Well, fast forward to this year. 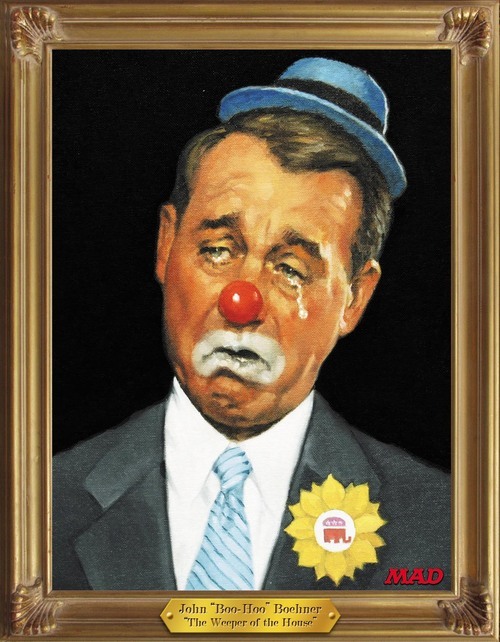 John Boehner and his merry pranksters passed a DHS funding bill. But they wanted to show that Kenyan in the White House that treating “illegals” like children of God was not going to wash with Republicans in firm control of both chambers. So they attached several riders to a must-pass bill stripping all of President Obama’s actions for DREAMers and his executive action on the undocumented. There, that’ll show him! Done and dusted, and the first round of drinks are on Rusty Boehner! A survey by the Commonwealth Fund found that 9.5 million fewer adults are uninsured now than at the beginning of the Obamacare enrollment season. The Urban Institute’s Health Reform Monitoring Survey found a similar drop, with 8 million adults gaining coverage. And Gallup-Healthways survey reported that the uninsured rate has fallen to 13.4 percent of adults, the lowest level since it began tracking health coverage in 2008. the Commonwealth Fund survey also suggested that most of the people who have signed up for the Affordable Care Act are happy with their coverage — and aren’t just disgruntled people who were already insured and liked their own coverage better. According to the survey, 58 percent of the Obamacare customers said they were better off under their new health coverage, and only 9 percent said they were worse off than they were before. Even among people who previously had health insurance — the ones who might resent having to switch — 52 percent liked the new coverage, while 16 percent said they were worse off. Tuesday: The President will welcome NATO Secretary General Anders Fogh Rasmussen to the White House, ahead of the NATO summit in Wales this September. In the evening, he will depart for Denver, Colorado, where he’ll spend the night. Wednesday: In Denver, the President will attend a DSCC fundraising event. He will then travel to the Dallas, Texas area for a DCCC event. In the evening, he will travel to Austin, Texas, where he’ll attend a DNC event and remain overnight. Thursday: While in Austin, the President will attend a DNC event, and will deliver remarks on the economy, before returning to the White House. it is now showing signs of coming back to the life it had before the previous administration began to mess with it. June marks 52 straight months of private sector job growth, the longest ever on record, beating out Bill Clinton’s record of 51 continuous months of private sector job growth from February 1996 to April 2000. The economy has added more than 200,000 jobs for five months in a row now, the longest such streak since 1999. In the first half of this year alone the economy has added 1.4 million jobs, another accomplishment not seen since 1999. First ladies typically avoid getting into public scraps, but Michelle Obama has jumped into perhaps her biggest battle yet. She’s fighting a House Republican effort to soften a central part of her prized anti-childhood obesity campaign and says she’s ready “to fight until the bitter end.” Mrs. Obama even mocked the GOP effort in an opinion column and argued her case on Twitter. “Remember a few years ago when Congress declared that the sauce on a slice of pizza should count as a vegetable in school lunches?” she wrote in The New York Times. “You don’t have to be a nutritionist to know that this doesn’t make much sense. Yet we’re seeing the same thing happening again with these new efforts to lower nutrition standards in our schools.” Mrs. Obama lobbied largely behind the scenes four years ago for the Healthy Hunger-Free Kids Act of 2010, which requires more fruit, vegetables and whole grains in school meals, along with less sodium, sugar and fat. It was a major achievement, the first update to school lunch rules in decades designed to make school meals more nutritious. Mrs. Obama says the requirements are based on sound science and that 90 percent of schools are meeting them. The association says districts are unprepared to meet the newest standards. “I’m going to fight until the bitter end to make sure that every kid in this country continues to have the best nutrition that they can have in our schools,” the first lady said at a White House event where she showcased elementary school students preparing and then eating a salad lunch using vegetables they had planted in her garden on the South Lawn. The White House has threatened to veto the House bill. The Senate version does not include the one-year waiver. House Republicans repeatedly refuse to even vote on legislation, let alone pass anything. And you have the gall to accuse the President of being the one in violation of the Constitution? Even more frustrating is how your repeated attacks on the President fall factually flat. In your essay for CNN, you write: “After years of slow economic growth and high unemployment under President Obama, they are still asking, ‘where are the jobs?’ ” This is a particularly laughable assertion given last week’s jobs report, which noted our economy added 288,000 jobs in June, marking 52 straight months of continuous job growth. Overall, under President Obama’s leadership, the private sector has added 9.7 million jobs and an economy that was in free fall when he was elected is now in a steady recovery. Civil rights groups have spent a decade fighting requirements that voters show photo identification, arguing that this discriminates against African-Americans, Hispanics and the poor. This week in a North Carolina courtroom, another group will make its case that such laws are discriminatory: college students. Joining a challenge to a state law alongside the N.A.A.C.P., the American Civil Liberties Union and the Justice Department, lawyers for seven college students and three voter-registration advocates are making the novel constitutional argument that the law violates the 26th Amendment, which lowered the voting age to 18 from 21. The amendment also declares that the right to vote “shall not be denied or abridged by the United States or any state on account of age.” Over the past decade, Republicans have campaigned to tighten rules for voters, including requirements for photo ID, in the name of preventing fraud. Democrats have countered that the real purpose of those laws is to make voting more difficult for people who are likely to vote Democratic. In Ohio, legislators proposed a law that would have cost colleges millions of dollars for helping out-of-state students vote locally. The measure died amid criticism from state schools. In Maine, the Republican attorney general — at the behest of the state party chairman — investigated 200 students for fraud. After finding no evidence, he sent the students a letter warning them to register their cars in Maine or to cancel their voter registrations. In Texas, voters must show a photo ID. A state handgun license qualifies, but a state university identification card does not. North Carolina students have also complained of government efforts, distinct from the new voting law, to shut down voting sites at Appalachian State University and Winston-Salem State University. BBC with the “DUH!” question of the day. But, a very interesting article nonetheless. The gun-control group founded by former New York mayor Michael R. Bloomberg (I) will begin surveying all federal candidates in the 2014 midterm elections on gun issues Monday as it tries to become a political counterweight to the National Rifle Association. Bloomberg’s group, Everytown for Gun Safety, is asking all Senate and House incumbents and candidates to complete a 10-part questionnaire stating publicly where they stand on issues such as expanding background checks for gun buyers, limiting the capacity of ammunition magazines and toughening gun-trafficking statutes. The U.S. will remain the world’s biggest oil producer this year after overtaking Saudi Arabia and Russia as extraction of energy from shale rock spurs the nation’s economic recovery, Bank of America Corp. said. U.S. production of crude oil, along with liquids separated from natural gas, surpassed all other countries this year with daily output exceeding 11 million barrels in the first quarter, the bank said in a report today. The country became the world’s largest natural gas producer in 2010. The International Energy Agency said in June that the U.S. was the biggest producer of oil and natural gas liquids. “The U.S. increase in supply is a very meaningful chunk of oil,” Francisco Blanch, the bank’s head of commodities research, said by phone from New York. “The shale boom is playing a key role in the U.S. recovery. If the U.S. didn’t have this energy supply, prices at the pump would be completely unaffordable.” Oil extraction is soaring at shale formations in Texas and North Dakota as companies split rocks using high-pressure liquid, a process known as hydraulic fracturing, or fracking. The surge in supply combined with restrictions on exporting crude is curbing the price of West Texas Intermediate, America’s oil benchmark. A state health initiative to reduce teen birth rates by providing more than 30,000 contraceptive devices at low or no cost has led to a 40 percent drop in five years, Gov. John Hickenlooper said Thursday. The Colorado Family Planning Initiative, funded by a private anonymous donor for five years, has provided intrauterine devices and other implants to low-income women at 68 family-planning clinics across Colorado since 2009. The clinics are in local health departments, hospitals and private nonprofit facilities. The program also provided training and technical assistance to family planning clinics statewide. “When families are planned and women have children when they’re ready and want them … it’s really a better situation for everyone,” Hickenlooper said during his state Capitol news conference. Seven of every 10 teen pregnancies in Colorado are unintended, officials said. The decline in births among girls 15 to 19 years old served by the program accounted for three-quarters of the overall decline in the Colorado teen birth rate, the state said in a news release. That rate has fallen from 37 births per 1,000 girls in 2009 to 22 in 2013, officials said. The teen abortion rate dropped 35 percent from 2009 to 2012 in those counties where the initiative is in place, Hickenlooper said. The family-planning program has saved $5.68 in Medicaid costs for every dollar spent on the contraceptives, the state said. The state has saved millions in health care expenditures — $42.5 million in public funds in 2010 alone based on the latest available data. Five percent of Americans report being newly insured in 2014. More than half of that group, or 2.8% of the total U.S. population, say they got their new insurance through the health exchanges that were open through mid-April. Given the population of the United States, this means that more than 15 million about 10-11 million American adults are newly insured this year. Almost 9 million of them received private insurance through the exchanges. There’s more (emphasis mine): The newly insured using exchanges are mostly under age 65, as would be expected, given that most Americans 65 and older are covered by Medicare. Thus, the representation of newly insured Americans is higher across all three age groups younger than 65 than is true for the general population. More specifically, newly insured Americans using the exchanges in the 18 to 29 age category are eight percentage points more prevalent than their percentage in the overall adult population, while representation of those 30 to 49 and 50 to 64 are five and four points higher, respectively.This means that the fears that the young would refrain from buying insurance, thereby fracturing the risk pools, don’t seem to be coming to pass either. No coincidence: all 3 women on #SCOTUS dissented. For women, only controversy about birth control is that we're still fighting for it. 5 conservative men on the Supreme Court decided that a core part of women’s health cannot be part of required employer-provided insurance coverage – even if the additional coverage costs nothing – at least as applied to private, family-owned corporations. All of the court’s female justices were joined by Justice Breyer in a strong and scathing dissent. it does, however, leave Democrats a major political opening when it comes to contraception. First, the majority explicitly held that HHS could in fact levy a contraception mandate – on insurance companies. In its language, the opinion refers to the method of contraception coverage HHS uses for employers already exempt from the contraception mandate (churches and other religious nonprofits) – requiring insurance companies to provide the coverage, outside of the employers’ policies but with no additional cost to the insured. Secondly, and more importantly, the decision relies on a law passed by Congress – the Religious Freedom Restoration Act (1993 thanks, Bill Clinton) – and not the First Amendment. it can be overridden by an act of Congress. Therein lies the major opening for Democrats in 2014 and in 2016. This decision not only puts the Right wing’s war on women back on the forefront just in time for the midterms, it points to a specific cure: have Congress change the law to override the Court’s decision. If Democrats wanted to run on a single issue from now to November, it should be a promise to write into the law protections for contraceptive coverage should we win back the House and keep the Senate. It is time that we, as Americans, found out what everyone asking for our votes stands on women’s health. Leave behind all of your trepidation about why the Democratic party isn’t perfect and how President Obama has “disappointed” you. You have no right to be outraged by today’s decision if you do not show up to the polls in November and ensure the election of a Congress that will override the law that the Supreme Court says allows for employers to control the reproductive lives of their employees. Following the one year mark since the release of the President’s Climate Action Plan, the U.S. Department of Energy (DOE) – in partnership with Air Products and Chemicals Inc. – today announced a major milestone, successfully capturing more than one million metric tons of carbon dioxide (CO2) at the hydrogen-production facility in Port Arthur, Texas. Using an innovative technology called vacuum swing adsorption, the project captures more than 90 percent of the CO2 from the product stream of two commercial-scale steam methane reformers that would otherwise be emitted into the atmosphere. In addition to the secure storage, captured carbon from the project will be used to help produce additional, hard-to-access resources from existing nearby oil fields. In total, Department of Energy projects have captured and securely stored nearly 7.5 million metric tons of carbon dioxide to date, equivalent to taking more than 1.5 million cars off the road for a year. In just the last year since the release of the President’s Climate Action Plan, these Department-supported projects have stored approximately 2.8 metric tons. Almost exactly a year ago, House Speaker John Boehner (R-Ohio) said in no uncertain terms that he would ignore the popular, bipartisan immigration reform bill passed by the Senate. The plan may have been endorsed by business leaders, labor unions, law enforcement, immigration advocates, leaders from the faith community, economists, and deficit hawks, but the Republican leader said it didn’t matter: the Senate bill was dead on arrival. Even if it had the votes to pass, it would never reach the House floor. But, Boehner said at the time, immigration reform was very much alive. “The House is going to do its own job in developing an immigration bill,” the Speaker vowed. “It is time for Congress to act. But I believe the House has its job to do, and we will do our job.” That was 51 weeks ago. And while Boehner probably meant what he said, the House Speaker made a commitment he could not keep. House members “will do our job”? Well, no actually, as is too often the case, the Republican-led chamber will do nothing. No longer willing to watch the GOP-led House do nothing, President Obama intends to move forward without legislative action. For his part, Boehner’s spokesperson, Michael Steel, told reporters this afternoon, “Speaker Boehner told the President exactly what he has been telling him: the American people and their elected officials don’t trust him to enforce the law as written. Until that changes, it is going to be difficult to make progress on this issue.” As talking points go, I find it hard to imagine any adult seriously believing an argument so transparently foolish. For one thing, Boehner himself already discredited the argument from Boehner’s office, admitting publicly that immigration reform hasn’t happened because his own Republican allies are afraid of hard work. Illinois will dramatically expand access to the ballot box this year by allowing voters to register on Election Day, and by significantly extending the hours early-vote locations will be open. Gov. Pat Quinn (D) has said he will sign the measure, passed by the legislature late last month. The bill expands both the number of days during which early voting locations are open and the number of hours each day they remain open. Voters who cast a ballot early will not have to show a photo identification. “Democracy works best when everyone has the opportunity to participate,” Quinn said in a statement. “By removing barriers to vote, we can ensure a government of the people and for the people.” Meanwhile, students at public universities will have an easier time casting a ballot under the new measure. The bill allows students attending public schools to change their residences from their hometowns to college campuses, giving them easier access to polling places on campus. The conservative majority on the Supreme Court today took up the case of some of America’s most disadvantaged workers, and ruled that they should be disadvantaged some more. The five-to-four ruling in Harris v. Quinn goes a long way to crippling the efforts that unions have made to help these workers get out of poverty. The case concerned some 28,000 home care aides in Illinois whose paychecks come from Medicaid. Before the state agreed in 2003 that they could form a union, they made the minimum wage. (It’s the state that sets their wage rate, since their pay comes entirely from Medicaid.) Currently, as a result of their union contract, they make $11.85 an hour rather than the minimum of $7.25. Tomorrow, by the terms of their contract, their hourly rate is raised to $12.25, and on December 1st to $13. The right to hire and fire these workers remains solely, of course, that of their home-bound patients and their families. The workers, then, are joint employees of both their patients and the state. And since the state allowed them to vote on whether to join a union, and since they voted to join the Service Employees International Union, these 28,000 workers have seen their pay doubled and have received, for the first time, health care coverage. Like all unionized public employees, they don’t have to pay that portion of their union dues that goes to their union’s political activities, but they do have to pay that portion of dues that goes to the union’s bargaining with the state that has produced their contract. Pamela Harris, who works at home caring for her disabled son, didn’t like those dues obligations, however, and sued to get them overturned. So, Ms. Harris had to pay $650 for her raise? Actually, no. She belongs to a different category of home-care workers, and unlike the workers who voted to join SEIU, her group voted against joining a union. She pays no dues to anybody. In a 5-4 decision, the Supreme Court ruled Monday that Hobby Lobby can ignore federal law and deny its employees comprehensive health insurance because of its “sincerely held religious beliefs.” Analysis of the case has so far called this a limited ruling because it only applies to closely held corporations and “only” impacts contraceptive coverage. But this framing completely ignores the fact that more than 90 percent of corporations in the United States are closely held, and that the court just effectively ruled that it’s fine for employers to discriminate against half of the labor force. There’s nothing limited about it. As Justice Ruth Bader Ginsburg noted in her powerful dissent, far from being narrow in its ruling, the high court just “ventured into a minefield.” The ruling sends a strong message that women’s health and women’s rights — as individuals and employees — do not matter as much as so-called religious liberty. It also shows once again that medically inaccurate ideas about healthcare can dictate the terms of a debate and ultimately win the day. To sum it up, five male justices ruled that thousands of female employees should rightfully be subjected to the whims of their employers. That women can be denied a benefit that they already pay for and is guaranteed by federal law. That contraception is not essential healthcare. That corporations can pray. That the corporate veil can be manipulated to suit the needs of the corporation. That bosses can cynically choose à la carte what laws they want to comply with and which laws they do not. Each specific finding opens a door to a new form of discrimination and unprecedented corporate power. If you think this ruling won’t affect you, you haven’t been paying attention. If you think these corporations are going to stop at birth control, you’re kidding yourself.